All over the world make for AMAZING Spa Treatments. Did you know that there is an EASY way to shop for supplies for your Day Spa online? Licensed pros in the beauty industry can purchase thousands of products at PureSpa.com. 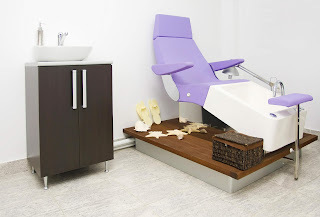 If you need perfect Earthlite bed, facial bed, pedicure bowls, towels or sterilizers, we have them. Hundreds of brands from all over the world, and there is something for every budget. What our clients love is that that our customer service specialists can help you quickly source everything you need to run your day spa business smoothly - and without hunting down different products from different stores or catalogs. Our team of experts is also well researched in current spa trends, treatments and happenings. Not sure what the hottest nail trend is right now, but need to stock your manicure stations? Call us, or browse our Mani/Pedi category online 24/7 and see what's new. Also be sure to shop our Just Added category where hundreds of new products are added every single week! Basically PureSpa.com is a beauty supply on steroids! We have offer the core products and supplies spas need along with innovative new products for professionals in the beauty, spa, nail and wellness trade. Why not shop online for spa supplies you need to operate your businesses in one place! PureSpa has it!